The name 'Small Boar' is a play on 'small bore' in reference to smaller capacity motorcycles. As the groups origins were in catering for bikes of 250cc or less, the name just sort of fitted. The idea of the Small Boar originated back in 2014 at the BMAD Paignton Bike Festival. Among the thousands of bikes at the event were a number of small capacity machines such as Honda CG's, Yamaha YBR's, Suzuki Marauder 125's. and a number of 200 and 250 cc bikes. What was apparent was these owners loved riding their bikes, but there was not a local club in South Devon which catered for them. The Small Boar was formed as a riders club to fill this gap. Inspiration also came from the Mild Hogs Motor Cycle Club that existed in north west England at the time. Despite the need for such a riders group, unfortunately it has to be said, riders have not flocked to us. However despite the dodgy start it has kept going in principle, as it was discovered a lot of bikers of larger capacity machines also were not interested in riding at fast speeds, but enjoyed riding at a pace comfortable for bikes such as Yamaha YBR's and others. 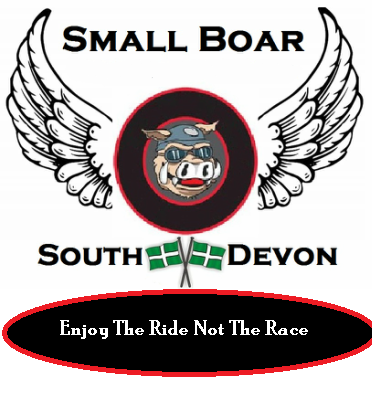 The Small Boar is being resurrected for 2018, but instead of simply being based in South Devon we want to include riders from Plymouth, West Devon, South East Cornwall, Exeter and East Devon. The plan is for meets on the last Sunday of every month with ride-outs throughout the year based on suggestions from within the group. If ours is the type of motorcycle grouping you are looking for we would your input on where these meets should be. We are also open to the idea of separate 'West' and 'East' meets during the winter, but that will be up to you. Some suggestions on possible meeting venues are below on the form on the left - so have your say! Also if you would like to help run The Small Boar, please complete your details on the form on the right. Would you like to help with running the Small Boar?